It worked for me as I am careful and have good electrical knowledge and am an EEE Engineer. My wife's daily commute is only 35 miles and I needed to replenish that at a faster rate so I can be sure it is fully charged in 4-5 hrs overnight. I looked around for the cheapest way to achieve this and I found the below link. Here is how I did it.. with a few convenient changes. If you DO NOT do this and wire up the 4 core wire and try to use the EVSE will go into an error state in about 2 minutes and will stop charging. This 33KOhm resistor fools the EVSE in believing that the FDCD is still connected. Alternatively you could hack the cable and break the 5-15 plug to retrieve the FDCD device and keep it plugged into that two pin port while you change to the 4 core cable. I did not do this as I did not want to break my original cable. Thats it your 220V EVSE L2 is ready and will charge at 12AMPS giving out 2.88KWHrs - Will charge at TWICE the rate of the 110V L1 EVSE that came with the car. The car sees it as as L2 240 EVSE and indicates 3.3KWhr charging. The upgrade should cost you about $10 for the L14-30(Ebay), $14 for the 6 feet of 4 Core 12 AWG wire(Home Depot) and $1 for 33KOhm resistor(Radioshack). Total about $25 and your time. If you really want to still have the 110V capability to charge then you can get L14-30 socket(ebay) and buy a 5-15P plug and wire it as suggested in the above instruct able. This should cost you another $15. It will be wired as below. Now in the L14-30 socket there is an EMPTY terminal put a small piece of wire here and short it with the Neutral white wire. Your 110V adapter is ready. This L2 EVSE is not as smart and as powerful as the EVSEupgrade which can actually give an output of 20+ Amps etc. and can charge the car at a faster rate which costs almost $300. If that is your need is charging much faster than 2.88KWhr this is not right for you as this does not charge at a very high rate. This is sufficient for me for now. If I really need a much faster charger then I would build myself an Open EVSE that way I have 2 chargers. Let me know if you have any questions and I am happy to answer. Hope this helps someone who has a need for a cheap L2 EVSE. Last edited by maini on Tue Jun 03, 2014 11:00 am, edited 2 times in total. How many charge cycles has it survived, so far?? About 5 charges.... 6th one going on right now... Do you expect anything to fail?? this is just a dumb device literally.. Interesting. The original EVSEupgrade charged at 12A on 120V and 240V. I wonder if it was done in a similar way. MOD NOTE: One thread per topic is fine, thank you. Threads merged. eHelmholtz wrote: Interesting. The original EVSEupgrade charged at 12A on 120V and 240V. I wonder if it was done in a similar way. Definitely not! All EVSEUpgrade.com upgrades replace the power supply (and any other things that can't handle 240volt like mosfets?) with a power supply supporting a wide range so it'll work on 120 and 240 volt. This horrible hack leaves the 120 volt power supply in place thus why they have to add the 4th wire. Please please please don't ever do this to your panasonic EVSE. While it appears to be a hack that'll work you are introducing problems that completely ruin the the waterproofness of the EVSE and thus the durability and safety of it. This is NOT safe. Electrical tape is not a proper form off insulation for something that is going to be outside on the ground and likely exposed to water, dirt, etc. As I have mentioned before, I did not exactly do that the instruct able says.. I changed it and made it cleaner. I used soldering as only 1 wire is cut and Sealed it with waterproof shrink insulation. The 4 core wire fits as tight into the insulation waterproof sleeve as the original cord. I also used some silicon to waterproof it. What else do you see an issue?? maini wrote: What else do you see an issue?? 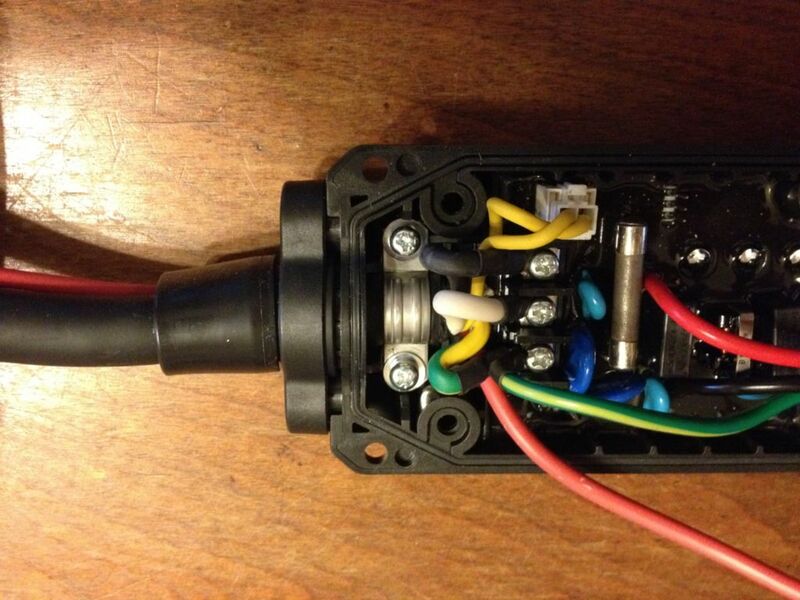 Some of the internal components are rated only for 120V and will fail in short order at 240V. I'm not sure what components need 240 volt capability, when that voltage is merely 120 volts on each Line. I'm not crazy about the way this was done, but I would like to see EXACTLY which component is operated over its limit. As long as the 120v stuff is still powered by 120v it seems fine to me.